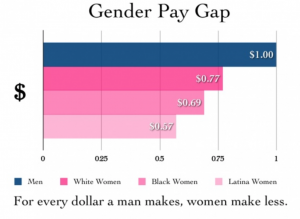 Echoes of the Fall: Gender pay disparity | Should Women Be Pastors and Leaders in Church? Continuing gender age gap: Women in Michigan earn 23 cents per dollar less than men (3/19/19 headline) . It’s hard not to see this long-perpetuated, systemic injustice against women as a powerful indicator of the gender bias and inequality which has pervaded nearly every culture since Genesis 3:16 which indicates that one tragic consequence of living in a sin-broken world is that men would rule over women. This was not God’s plan, intent, or desire. Like death, painful childbirth, a broken creation where weeds hinder food production, etc., the rule of men is a tragic and sinful expression of sin’s curse. Jesus came to set us free from sin and its curse and to restore the gender equality of the original creation. Jesus’ apostle wrote, “there is no male and female, for you are all ONE in Christ Jesus” (Galatians 3:28). Paul was not suggesting that there are no gender differences, but rather the elimination from hierarchy and oppression which sin imposed on the genders even as it did on ethnic and social relationships (“There is neither Jew nor Gentile, neither slave nor free, neither is there male and female, for you are all ONE in Christ Jesus,” Gal 3:28).